BBC NEWS | Technology | Who's afraid of the iPhone? Apple's iPhone may have only been on release for a few months but it is making waves in the global mobile industry. So how are competitors responding? More than 285 million handsets from a plethora of manufacturers were sold globally between July and September this year, according to recent figures from research firm Strategy Analytics. The figures are up 12% on last year, and each and every week new handsets and services are launched into a burgeoning market ever hungry for more features. Apple is the new kid on the block and managed to sell 1.4m iPhones in the first 90 days on sale. The device goes on sale in the UK and Germany on Friday. It is an impressive number but a fraction of the global market. And the companies who dominate the global market are putting out handsets that are serious competitors. Eight phones can be considered rivals for the customers Apple is targeting. It is clear that Nokia, LG, Samsung, Sony Ericsson, HTC and Motorola, are keeping their eyes firmly on Apple's progress. "There's no sign of panic from competitors," said Jonathan Arber, a principal analyst at Ovum. "There's no scrambling. But anyone who is trying to take market share concerns them." Last week Samsung unveiled a camera phone in the grand surroundings of the British Museum, in London. Amid the antiquities, journalists from 35 countries around the world were flown into London and put up in five-star hotels at Samsung's expense to get a first look at the new handset. The G800 would not appear to be a direct competitor to the iPhone but in a question and answer session with executives Apple's device was brought up several times. "What is Samsung doing to match the user interface of the iPhone?" asked one reporter. We think it provides everything the iPhone does but also GPS navigation as well. "We're actively working on new user interfaces and you can expect to see something special in 2008," said one of the key execs. Other firms have also been quick to roll out devices which they say offer all of the features of the iPhone yet "cheaper, simpler, faster, better". But Apple, for now at least, is only targeting a small sector of the mobile market. By comparison Nokia hit the 40% magic target of market share globally, said Mr Arber. "And it appears to be growing constantly," he added. Mr Arber said the iPhone could drive the handset market in general over Christmas. "There will be a lot of buzz around the iPhone and it may have a halo effect on other devices. It might well raise consumer awareness of a new top end of mobile handsets out there that have good internet and data communication capabilities. "Obviously some people may go looking for the iPhone but may be put off by the price and I think Apple's various competitors in the market will be positioning themselves to take advantage of that." 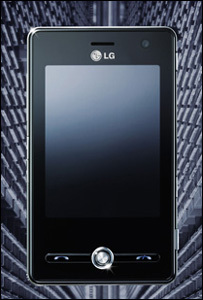 Mr Arber cited the Viewty and LGKS20 from LG, the Sony Ericsson touch screen W960, the HTC Touch, and Nokia N95 as natural iPhone competitors. But there are others: in recent months Palm has launched the Centro, Blackberry has launched a new Pearl in Europe, T-Mobile has the Sidekick Slide and Samsung has its Blackjack. Mr Arber said the iPhone's touch screen was the application that most competitors would be seeking to emulate. "It's only just being explored to its fullest. The iPhone right now does it fairly well. It's going to be the touch screen experience competitors will be looking to beat." But it is not just the hardware that Apple's competitors are seeking to beat - it is the services also. Apple's iTunes music store and its integration with the iPhone is seductive for many people. To counter that Nokia and operator Vodafone have launched separate services which they believe are iPhone killers. Al Russell, Vodafone's head of internet and content services, said the iPhone was a "significant development in our marketplace". But he said Vodafone's MusicStation, which is a subscription-based music service, offered functionality that the iPhone could not match. "This generation does not want an archive of music. We offer unlimited music on a rental model - no-one has done this in the marketplace, and certainly not the iPhone. "We know our customer base have tremendous appetite for new music and sharing." Nokia's UK managing director Simon Ainslie said the model of the iPod and iTunes had been very successful but they had relatively little penetration outside the US and UK. "We have 900 million users of our phones worldwide and there is an opportunity here for us to provide a service to the device in their hands wherever they are." 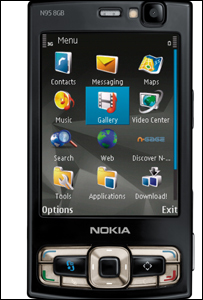 He said Nokia's N95 mobile phone, the flagship device for the firm, was more than a match for the iPhone. "It's hugely successful; one of our all-time greats. "We believe it stands very strongly against the iPhone and we think it provides everything the iPhone does but also GPS navigation as well. "Navigation is a feature people will want and will be huge in the future through location-based services." The iPhone goes on sale at more than a 1,000 O2 stores, Carphone Warehouse outlets and Apple's own shops on Friday at precisely 18.02GMT. Consumers, analysts and competitors will all be watching closely to see the level of demand and if the hysteria seen in the US will be replicated in the UK.